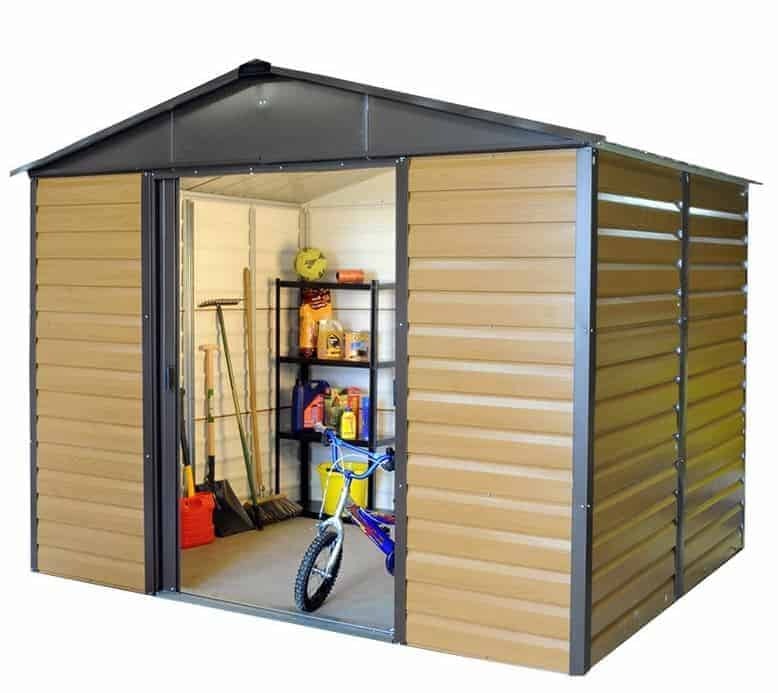 Metal sheds don’t have to look metallic, as proven by this large and attractive storage shed from leading name Yardmaster. From a distance it looks very much like a traditionally rustic wooden shed, thanks to its brown oak style paintwork and its shiplap style cladding. Despite this it has one significant advantage, which is that you won’t have to spend time and money on retreating it every year. The shiplap cladding also has the effect of causing rain to bounce off the surface, as does the apex roof at the summit. This means that the shed itself has great weatherproofing qualities which are further enhanced by the use of galvanised cladding across all the surfaces. It means that you can forget about unsightly rust appearing for many years, as backed up by a decade long manufacturer’s warranty. We also like the tall headroom offered, thanks to the high eaves. This means that you can safely store tall items within, as well as safely walking around without bumping your head. 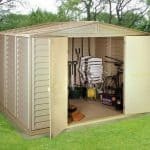 It’s surprising just how much can be fitted into this shed, so you can easily store a bicycle or two in it, as well as a lawn mower and all your gardening equipment. It’s hard not to be impressed by the appearance of this shed. It’s imposing size is complemented by a convincing wood effect finish upon shiplap metal panels, with ebony detailing. Whilst it looks very much like wood it suffers none of the problems that particular substrate can have, meaning there’s no chance of rot and no need to purchase wood preserver. In effect, therefore, this shed presents the best of both worlds. It was good to see an apex roof on top of the cladding, as no other style is as effective at carrying rain and snow away. It’s advantages can also be seen in the generous ridge height of 2.24m as well as the eaves height of 1.83m. 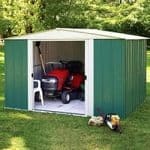 Both of these are in excess of the dimensions we find on most metal sheds we review. 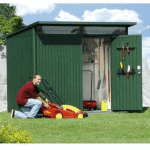 The overall width of the shed is 3.03m and the overall depth is 1.97m, so you’ll need a base of at least these proportions. Whilst the cladding looks like wood it is much thinner and lighter, which in turn makes it much easier to manoeuvre during the installation process. Some of the edges can be sharp, so we were pleased to see that Yardmaster had thought of this and included a heavy duty pair of gloves to use during assembly. Despite the thinness of the cladding, it forms a strong and stable whole, and this is in part due to the galvanisation to which the steel has been subjected to. Whilst there is no floor, there is an anchor kit included within the flat pack. This makes it very easy to screw the shed into a pre-existing concrete floor, or alternatively into a level area of patio or paving. The screws supplied are also galvanised, and therefore rust free, which we thought was a nice touch. Galvanised cladding not only creates a rigid and reliable structure, it’s also very effective at stopping rust formation, especially as the shiplap design used on this shed also prevents water ingress. It’s for these reasons that we would have liked to see a longer warranty provided against rust perforations. 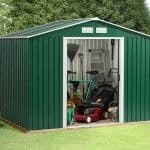 Whilst the warranty is valid for 10 years, without any treatment requirements, we review many similarly sized metal sheds that offer warranties of 12 or even 20 years. One feature of this shed that really impressed us was the double sliding doors. They open to a width of 1.25m and have a height of 1.78m. Once more, this makes them more accommodating than most sets of doors we find on metal sheds. We also like the fact that they are fitted internally, which not only looks neater thanks to the sliding mechanism being hidden away, it also makes them more secure and resilient. There are no windows in this shed, although the white painted interior doors help to make the most of any light from the door opening. If you’re going to be spending time in the shed, then you’ll need to install an artificial light source. There is, however, natural ventilated provided around the ridge and eaves. With security such an essential factor today, we would have liked to see it enhanced on this shed by the inclusion of a padlock. The handles are holed so that one can be fitted, yet none has been supplied by the manufacturer. 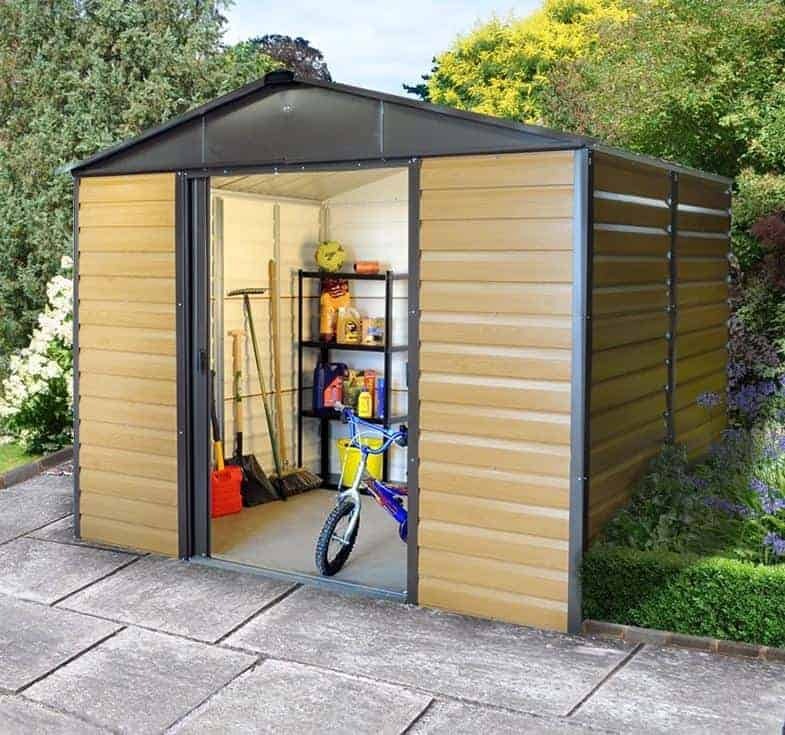 We’d certainly recommend that one is purchased, which could then create a secure environment as the window free design hides the contents and thus reduces the risk of opportune thieves selecting this shed for an attempted break in. Whilst a padlock can’t be purchased directly with the shed, it’s easy to find one from a leading brand for less than twenty pounds. One optional extra that can be bought with the shed, and that we really liked the look of, is a 2’6 X 1’8 resin shelving storage unit. No storage shed is complete without racking, and the advantage of this four shelf set is that it can easily be positioned anywhere and is then strong and stable enough to stand alone without having to be screwed on to the frame. The finish is obviously high quality from the moment you see it, but that doesn’t mean the little things have been neglected, as shown by the use of rust free screws. A slightly thicker cladding would help to make this shed even more durable, yet we still feel that this shed should last beyond its 10 year warranty period. We like the unusually tall ridge and eaves height, as this creates a much more flexible storage space with tall items as easy to store as wide items. As we expected with a shed of this size, there are a lot of individual components, so we would advise organising them methodically before starting the installation. You’ll need at least two people, and assembly should then take around four to six hours. This costs a little more than some of the metal sheds we review, yet we think it’s worthy of its price tag thanks to its spacious storage capacity and striking good looks. 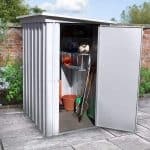 Final Thoughts: You’ll probably find that passers by think this is a wooden shed at first glance, and it really is one of the most attractive metal garden buildings that we’ve reviewed. 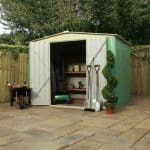 It’s aesthetic appeal isn’t the only feature it has going for it, and we can see this shed providing years of loyal service in sheds of all sizes. Because it’s both deep and tall, it’s possible to store much more in here than you first think. With the addition of a good quality lock and alarm system we can even imagine this being used to store motorcycles in a dry and non-combustible environment.